North Korean leader Kim Jong-un could still visit Seoul within the year, with the US fully supporting the plan, President Moon Jae-in said Saturday onboard a flight from Buenos Aires to New Zealand. “The possibility of Chairman Kim Jong-un visiting within the year remains open. President Trump and I shared the view that Kim Jong-un’s visit to Seoul would play a very positive role in North Korea-US denuclearization talks,” Moon said, referring to his meeting with US President Donald Trump in Buenos Aires, Argentina, Saturday (Korea time). Moon added that Trump asked him to give Kim a message, should the North Korean leader visit Seoul. “(Trump) hopes to fulfill the agreements made with Chairman Kim Jong-un,” Moon said, adding that Trump had said that he would give Kim what he wants. Trump described himself as having a “very friendly” attitude toward the North Korean leader, according to Moon. Moon later elaborated that Trump’s promises to Kim refer to a range of issues, including guaranteeing Kim’s regime and economic development after complete denuclearization. The South Korean president, however, said that whether the visit would take place this year remains unclear as the decision is up to Kim. 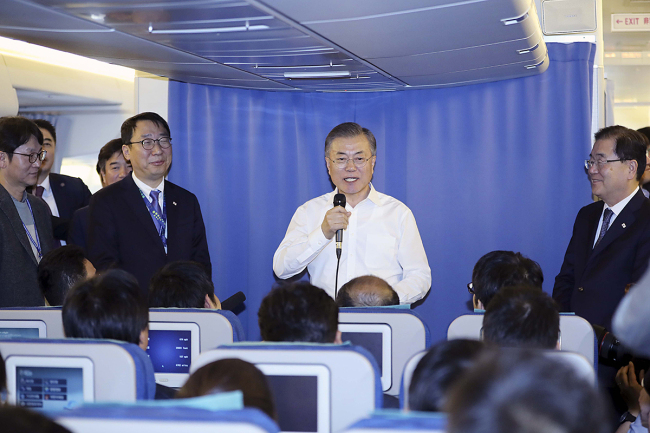 In the press conference held onboard Air Force One, Moon said while Seoul is engaging Pyongyang, details pertaining to the execution of the Singapore agreement need to be hammered out between the US and the North. Highlighting that Pyongyang and Washington reached an agreement in principle in Singapore, the South Korean president said the two sides now need to work out details such as timetables, and that he and Trump agreed on the need for a second US-North Korea summit. Regarding the North’s demands for measures corresponding to its denuclearization steps, Moon said that such measures are not limited to those regarding sanctions. Pyongyang has been demanding the US and the international society take steps in response to what it calls significant steps toward denuclearization. “For example, postponing or reducing South Korea-US military drills could be a type of corresponding measure,” Moon said, adding that sports exchanges and humanitarian aid could also be considered as such. At the press conference, during which he refused to take questions on domestic issues, Moon also stressed that Seoul-Washington cooperation remains as close as ever, rejecting speculations of cracks in the allies’ North Korean policies. “Having met and spoken with President Trump several times, I feel significantly that trust and friendship have been built. President Trump assesses the current situation quite positively,” Moon said, when asked about concerns of discord between the allies. Saying that Nov. 29 marked one year since North Korea’s last provocation, Moon said that he and Trump shared the view that significant progress toward permanent peace has been achieved. Moon also emphasized that no part of Seoul’s interactions with Pyongyang so far has been carried out without consultations with the US and the UN Security Council.